Sarah Wilson’s mission is to help people help their dogs. Sarah Wilson is a trainer of extraordinary accomplishment with whom I had the pleasure of speaking over these last weeks. Like her many books, her popular training videos at YouTube are models of communicative clarity. Not one to get bogged down by theory or chatter, Sarah’s approach to her craft is exceptionally direct and hands-on, producing no less exceptional results. Her widely recognized work with children, in whom she has long cultivated a healthy respect for our canine friends, became the focus of our discussion. Sarah Wilson’s mission is to help people help their dogs. She is a passionate teacher, guiding people in easy ways to life with their beloved canine companions. 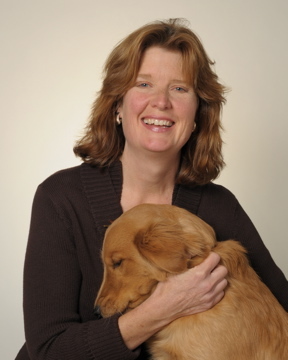 With more than twenty-five years experience as a professional dog trainer, a lifetime of living with animals and a Masters Degree, Sarah has written eight books on the subject. Her first, Good Owners, Great Dogs, published in 1992, has sold more than 360,000 copies. Seven more followed. Titles have been translated into Japanese, German, Italian, and Polish, and three have made Amazon’s Top 100 list. 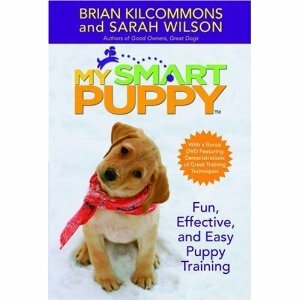 My Smart Puppy (book with a DVD included) and Childproofing Your Dog are her current top-sellers. 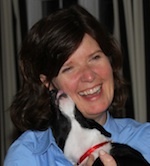 Sarah has overseen an active community at her high-traffic website, MySmartPuppy.com. for more than a decade. In the top 2% of all websites, MySmartPuppy.com hosts a friendly, supportive, moderated community where Sarah and a team of other professionals offer support and suggestions to all. Appearing on a variety of network and cable TV shows including PBS’s Nature “Why We Love Cats and Dogs,” Good Morning America, Nick Jr’s A Pup Grows Up, Comcast, and CBS This Morning, and quoted in O Magazine, Parade, LA Times, Forbes.com, PBS.org, and Amazon.com, Sarah is an active advocate for easy, effective and fun methods that add joy to our lives. Winner of the Dr. A. Wayne Mountain Memorial Media Award, Pennsylvania Veterinary Medical Association and the Dr. Steve Kritsick Memorial Award, New York State Veterinary Medical Association as well as being nominated for two Genesis Award Nominations from the Humane Society of the United States, Sarah is recognized for her enthusiasm, passion and dedication to educating people and their dogs. 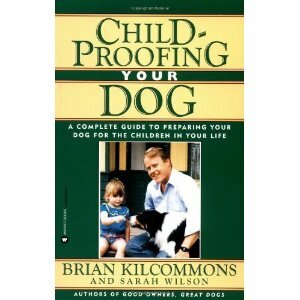 JBY: Since its publication in 1994, your remarkable book, with Brian Kilcommons, Childproofing Your Dog:A Complete Guide to Preparing Your Dog for the Children in Your Life, has attracted a great deal of attention. Can you describe what your book is essentially all about? SW: Childproofing Your Dog prepares the dog for the child and the child for the dog. How can dogs be ready to interact with kids if we don’t prepare them? On the whole adults tend to be consistent around dogs; we usually approach them in the same way, feed them in pretty the same way, and even play with our dogs the same way. Children, who are nothing if not variable, are playful, unpredictable, and wild compared to most grownups. For a dog unaccustomed to all that, a child can be confusing and frightening. It is very important that we prepare our dogs for kids, while, at the same time, preparing kids for dogs. We need to do both in positive, upbeat ways. JBY: At what age do you recommend kids begin to learn about how to behave around dogs? SW: As soon as a child learns how to approach another human being politely, he can learn how to approach animals. It is exactly the same protocol: You stop at a polite distance, you introduce yourself, and you wait for the other to respond. If they do not respond, you leave them alone. Most of us spend a lot of time teaching our children how to be polite to adults. Were we to spend that same time teaching children how to be polite to animals, there would be far fewer bites and problems. Stopping at a polite distance allows flight to happen, so that fight doesn’t happen. But if you remove the possibility of flight, you severely limit the dog’s options. JBY: Should parents first work with professional trainers who are familiar with the specific issues that can arise between children and dog? Under which circumstances is this best accomplished? Privately, at home, or within the broader social context of a group class? SW: In short: Yes! Getting professional input is always a good idea. Whether or not you engage a competent trainer for private sessions, or join a local group will depend on what is locally available. Given both the benefits and the potential at risk for you and your children, getting professional feedback is a great idea. JBY: At what age can a dog join the family? And what sort of dog is best? SW: I advise parents to wait until their youngest child has control of his motor skills. Before that a child may very well want to be gentle, but may be physically incapable. So make sure your child is developmentally able before bringing home a dog. It’s no less important, before bringing a puppy home, that he loves your kids, and that your kids love him, too. Once you know that, you can work out the details. After all, you want a puppy who, the moment he sees your children, wags his tail and then gets all squinty-eyed, as if to say “Wow! Children! How cool is that?” You can see on a dog’s face if he likes kids. Just like humans, dogs tolerate what they love; for dogs who love children, there is more of a margin of error. Be sure to get a dog who really adores children, not one who merely sits still and puts up with them. JBY: For those with children who are considering bringing a puppy or a dog in to their home for the first time, is there a specific breed you recommend? And for a dog or even a puppy that might at first appear to be indifferent to a child, or even unfriendly, is this something that can be addressed through training? SW: I look for temperament before breed. The reason so many Labrador Retrievers make wonderful family dogs is because, among other things, they are not sound sensitive; they will tolerate the sound of children and the sounds children make. Labs are also touch insensitive; they are gun dogs, after all, who can plow through bushes and thorny nettles without batting an eyelash. These are wonderful qualities in a dog that is going to spend time around kids. But remember: Temperament is very hard to change, while behavior is easy to modify. Don’t try to change the dog’s temperament. If he doesn’t care for children, the odds are he never will be as reliable around kids as a dog who does. Whatever you do, don’t give up on your quest. You can find the right dog, and a good rescue or shelter will help you in your search. JBY: Do you work with different age groups, — say, 6- 12, 13-17, etc – and if so, how does your approach to teaching vary, if at all, within those groups? SW: Absolutely. With younger kids, for example, I work on how to be polite in the company of dogs. At that age — 3 to 5, say — empathy may not yet be quite fully developed. But even children that young are still aware of how they feel. With regard to an unwanted behavior, children will understand when you say “How would you like it if somebody did that to you? Did you know that dogs feel the same way?” It’s not a good idea to respond to a child’s inappropriate behavior towards a dog by lecturing him, or by telling him that his actions will upset a dog. That’s too difficult a concept for a young child to grasp. Instead, children need to understand that a dog feels the way they feel. Bridge the gap. Talk to them. With older kids, however, you can explain how a dog can become upset. I encourage teenagers to help younger children to learn. I do that by appealing to their status and their desire to lead. This inspires them to want to do the right thing, and to take the lead. What I convey in every case, then, is essentially the same message, but one that is matched to the child’s particular developmental stage. JBY: What is the single most important bit of advice you can give parents with regard to insuring their kids’ happiness and safety around dogs, as well as that of the dogs themselves? SW: Learn how to read canine body language! If you don’t know how, then ask yourself: What would this or that gesture mean if a human did it? Act on that. For example, if your child is playing with your dog, and your dog gets up and moves away, simply say “Don’t follow him; he is saying he has had enough for now.“ If you permit your child to pursue the dog, you will force the dog to express himself in another way. At a certain point, especially around energetic kids, a dog will have had enough, and just like people, will need to take some space. JBY: Can you elaborate some of the warning signs of an uncomfortable and potentially agitated dog that a child might be able to easily identify? SW: If the dog is frozen or stiff, that means he is not happy. So act on that. That behavior tells us something important. If that happens, remove the child from the situation. Doing that alone would avoid so many bad interactions, which presumably “came out of the blue”. But the truth is, aggressive behaviors very rarely come out of the blue, though the early signs can be missed by many. In fact, a dog will often give five or six signs before he growls. So learn those signs. A dog who moves away from a human is just one of them. Another can be closing the mouth. A dog that looks at a child and closes his mouth as the child approaches may be uncomfortable. If he freezes in place, that is also a sign of stress; it is one of the things a dog will do before he decides whether to fight or take flight. If the dog does freeze, then ask the child to be still; don’t allow him to get any closer. Stop the child before the dog has to choose. However, if the dog flees, then let him flee. If you interfere with flight, you will force a dog to fight. I’ve encountered situations where a dog is in flight mode, but restrained, only to snap from the stress. That is because his first choice –to flee — has been eliminated. Adults who can read a dog’s body language, and understand what they’re seeing, can put a stop to what is happening before a dog growls or snaps. JBY: In a public situation, where a young child, barely bigger than a large breed dog, comes running up to the dog, arms flailing and eager to pet him, what do you do? Do you remove the dog immediately form the situation and caution the child to stop at once? Or do you pull the child and his parents over to the side and offer them advice on the proper way to approach a dog? Or will doing so only serve to frighten them? SW: When a child runs up to your dog in that way, stop them, but with a big smile on your face. Then show them how to approach the dog properly. Explain how to do so in a gentle and friendly way. Keep it relaxed, for both the child and the adults. Unfortunately, parents don’t always do that. You need only ask a child: Would you run up to a strange man flailing your arms as you hug him? They will understand that. It also depends on the dog, as I want my dog, too, to know that I will protect him. Dogs should always have confidence that their humans will protect them from whatever it is that might make them anxious. If the child approaches in a polite way, I would still ask them to stop and ask me if it’s OK to pet the dog. My job is to teach children how to interact. Then I’ll tell them, “You did a good job waiting!” so as to let them know just how well they did. The idea is to turn circumstances into an opportunity for teaching kids the appropriate way to interact. I owe that much to the child, and also to the dog that comes along next. Then, when the parents come along, I’m able to tell them what a great job their child did. There’s a real opportunity here, so why not make it a really positive one? Both the child and his parents should leave while still thinking about what a pleasant experience it’s been. Certainly, no one wants their dog to bark at people! Ultimately, it’s very important for children to learn that if you love animals, you must also respect them. Teaching should proceed from politeness and respect, but never from fear. JBY: Do you encourage parents to bring their kids to puppy and dog training classes? And do you recommend that children learn at least something about teaching their dogs the basics, such as sit, heel, and stay? SW: I have lots of things people can do with younger children. If your kids can be in class and not be disruptive, that’s fine. I keep a stash of coloring books and quiet games for kids on hand, just in case. In my classes, both kids and their parents learn all about polite greeting. One exercise I love is tethering then dogs (flat collars, short tethers) then having everyone in the class go around for a session of “greet and treat”. During this, I also teach them to observe and how to recognize canine body language. It’s great opportunity for kids to learn and a chance for the dogs to socialize. Tethering the dog for such games, which is perfectly safe, prevents anything that might frighten a child from happening, such as a dog’s jumping up. With the dog tethered, the children don’t have to worry about being knocked over. JBY: Are there any training tools or implements you recommend that children should use for teaching? SW: Again, a tether attached to a flat collar works perfectly. A child can then practice approaching the dog without being overwhelmed. He can also practice sits and downs. I don’t like to give children any tool that might cause pain or discomfort, either to them or the dog, although any tool, if used improperly, can cause discomfort. It is for this reason that I use tethers frequently in class. Off tether, I’ll have the adult handle the leash and follow through for the child, as this tends to keep things calmer. In this instance, the adult is asked to simply follow through if the dog is confused and to refrain from praising or rewarding the dog. Instead the adult remains neutral and lets the child praise and treat the dog instead – assuming that is safe. JBY: What can you tell us about tethering? Do you recommend certain exercises, using a tether that will help kids both train and improve their relationship with their dogs? And do you also recommend that their parents supervise them at all times? SW: First, this sort of tethering is part of the training. The dog is always tethered to a something immobile and is always supervised. This is used to help create success for all concerned so there is more productive practice and more rewards given. I discuss a number of useful games in Childproofing Your Dog. For example, there’s this: Using a thin nylon cat lead, I open a door, put the loop around the doorknob on the door’s far side, and then close the door. Now the leash is safely attached, because it cannot come off. I clip that onto a buckle collar. Now the dog cannot leap all over the child or get out of control, and we can proceed to practice sits and downs. This also allows us to practice distractions, such as walking up to the dog in various slightly distracting ways then rewarding the dog when he sits. This teaches him S.I.T, that is, “Sit Is It”. That means, when in doubt, SIT! Once he does, I’ll ask the child to walk up to the dog. If the dog does not sit, the child simply steps back and tries again. When the dog does sit, and most will give sit a try, the child smiles, praises and treats the dog. Pretty soon, when approached and no matter how he is approached, the dog will sit. Immediately. Without a verbal command. People love that! All this is part of childproofing. Adults tend to be consistent in their approach and behavior towards dogs, whereas children do things differently. So we have to accustom our dogs to the different ways in which people, kids included, might approach them. We tend to turn dogs loose on kids without any warning as to what they might expect, and this is exactly why we need this sort of training. We need to reinform dogs who are otherwise misinformed. JBY: How much time should adults, as well as children be prepared to commit to training? SW: Sometimes people think they don’t have time to practice. But training should not be a special occasion; it should be ongoing during the dog’s lifetime. One thing I always ask parents is: Do you only spend a special half an hour a day teaching your children to be polite, or is that something you do all the time as you instill these values? Just integrate the training with normal life. Make it fun for everyone, including the dog, and they will love doing it. The misconception is often that you have to be pushy or mean to get results. But that’s not true; we don’t have to be pushy or mean, nor do we want anyone to interact with a dog in that way. We only want to “get to the good “as fast as we can! So, for example, if a dog barks, how do we “get to the good”? We say, “Look at me!” What I essentially do is to gauge where and how the people are having problems with their dogs, and then support them with positively focused problem solving. JBY: Only rarely does one see a small child walking an average or large dog nowadays, though it is not unusual to see them alongside a toy breed. What do you counsel young children to think about and do when taking their dog for a walk? SW: Never let a child walk a dog that is more than one third of the child’s body weight. If you have a dog that is bigger than your child, walk alongside the child, but use two leashes; let the child hold one while you hold the other. Alternatively, both adult and child can hold on to the same leash. But never set a child up for tragedy. You have it within your power to prevent bad memories. JBY: When an adult sees a child mistreating a dog in any way, what do you recommend they say or do? And how would you deal with a child who has done so? SW: The first thing I do is stop it. Without saying a word, I immediately move the child away from the dog. Being moved away without delay by a silent adult sends a very clear signal. In a case of that sort, you first need to stop what’s going on, and then explain. A young child may not understand that what he’s done, or was about to do, is inappropriate. If you think the child does understand, and also believe that he may have deliberately harmed a dog or another animal, that sends up a huge red flag. In that case, the child needs professional help immediately. Empathy is indispensable around animals, whereas a lack of it indicates a very serious problem. JBY: What do you advise children to do when approached by an unknown dog? If the dog seems menacing, should they stand still, run away, or yell for help? SW: The first thing to do is to stand still, turn sideways and shuffle away from the dog. So much depends on what is actually going on. The good news is that only rarely, if at all, will you find yourself in the presence of a truly menacing dog. But if you do — and your kids need to know this — keep everything in, snug, with your hands close to your body. Then slowly move away from the dog. I remind kids about the kinds of things dogs chase – cars, balls, bicycles, etc. But do they ever chase a building? No! If you don’t want the dog to chase you, become stationary. Do not stare at the dog, and after standing still for a few moments, just move away. JBY: Recently, I saw a video of an obviously friendly, loving, and well socialized Labrador Retriever cuddling on a couch with a toddler. It was very cute, of course, and though there was an adult nearby filming it all, is this really a good idea? If not, why not? And what would you advise t parents on this issue, no matter if their dog is the nicest, friendliest pooch in the world? SW: Most pet dogs are incredibly tolerant of us humans. Statistically speaking, your child is much more at risk with an adult human than they are with a dog. But you need to learn how to read the dog’s body language. I don’t allow a child to do to a dog what they do to a younger child. They can’t chase him around, drag him, tackle him, or throw things at him. This is not acceptable behavior. Instead, I look for three things from the dog: Is the tail wagging? Does he choose to stay frozen where he is? Is he glaring? If in that video, the dog had gotten up, glared at the child, or frozen, or failed to acknowledge the child at all, that would have been a matter of serious concern. In fact, those signals are very similar to what a human might do to threaten another human. If you use this as a template, you’ll be in a much safer place. Imagine if a child approached an adult stranger, and the stranger looked off into the distance, pretending the child did not exist, in that case, we’d know right away that something was very wrong. Dogs are generally very tolerant of adults and children, and while it’s important to teach these things, let’s not imagine that every pet dog is a danger. Rather, we simply owe our dogs and our children an education. Always remember that simply because your dogs love your children, doesn’t mean every other dog does. And the fact that one dog may look like another that the child knows to be friendly, does not mean it is. Kids need to learn that. JBY: Nothing could be more heartbreaking for a kid (and adults, too) than losing a dog, be it from illness, an accident, or even from running away. How do you counsel kids and their parents in the face of such loss and grief? SW: Again, how we respond to loss must be appropriate to the child’s mental stage. Ultimately, it’s a family affair. Tell your kids how upset you are, but let them tell you, too, how upset they are. I suggest using scrap books and drawing pictures of your dog, which you can go through, reminisce and talk about. Let the kids process it all. Also, ask the child questions and listen; always see just where they are. Young children of 2, 3, or 4 are surprisingly pragmatic. Their first question might be simply, “Can we just get another dog?” Older kids need to talk about it. Doing all this as a family is very important. In that terrible scenario where the child might have left a gate open and the dog slipped out, be sure to let them know that it could have happened to anyone, and that the dog loved them very, very much. And always remember the good stuff…. ARTICLE: Keeping Toddlers and Dogs S.A.F.E. A disclaimer: Sarah Wilson is a trained professional with decades of experience, so use caution and common sense when applying any of her methods, especially with a “reactive” dog or a dog you don’t know. When in doubt, consult with a professional trainer.